1992-09-08. New. Ships with Tracking Number! INTERNATIONAL WORLDWIDE Shipping available. Buy with confidence, excellent customer service! Berkley Trade, 1992-11-01. Paperback. Used:Good. Berkley Trade. PAPERBACK. 042513511X New Condition. . New. Berkley Trade. PAPERBACK. 042513511X Like New Condition. . Fine. Berkley Trade. Used - Very Good. Great condition for a used book! Minimal wear. Berkley Trade. Used - Very Good. Ships from Reno, NV. Great condition for a used book! Minimal wear. 100% Money Back Guarantee. Shipped to over one million happy customers. Your purchase benefits world literacy! Berkley Trade, November 1992. Trade Paperback . Good. Light edge and cover wear. Unmarked pages. All Orders Shipped With Tracking And Delivery Confirmation Numbers. Berkley Trade. PAPERBACK. 042513511X Ships from Tennessee, usually the same or next day. . Good. 1992. Berkley Trade. Used - Good. Ships from the UK. Shows some signs of wear, and may have some markings on the inside. 100% Money Back Guarantee. Your purchase also supports literacy charities. Berkley Trade, 1992. Softcover. Good. Oblong Softcover. Sound & okay copy, light rubbing/edgewear to wraps, some soiling, small hole punched at front wrap. Berkley Trade. Paperback. GOOD. Spine creases, wear to binding and pages from reading. May contain limited notes, underlining or highlighting that does affect the text. Possible ex library copy, thatâll have the markings and stickers associated from the library. Accessories such as CD, codes, toys, may not be included. New York: Berkley Trade, 1992-11-01. Paperback. Good. 96 pages; edge wear, some light damage to back cover; Ten million dog lovers celebrate their best friends' birthdays. 28 million buy their pups Christmas presents. These are the people who'd love to treat their pooches to some home cookin'--with a little help from Dog Bites! 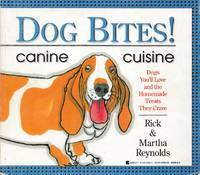 Features fully illustrated, heartwarming stories and original recipes, plus a special section on making Fido's birthday special.